In this conversation, director Helen Purcell talks with parents about academics at Living Wisdom School. 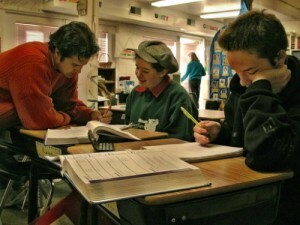 Public and private schools usually try to measure academic rigor with standardized tests. And when colleges and universities evaluate applicants, they generally consider the child’s grade point average and how many AP (advanced placement) classes the student took in high school. Parents generally also judge a school’s academic rigor by the caliber of the high schools that accept its graduates. The concern about academic rigor connects to the idea that everything a school does should support the next step in a child’s education. 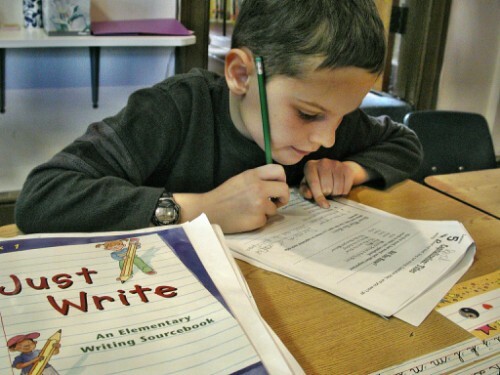 In elementary school, the curriculum must be planned so that children will be accepted by a prestigious high school; then high schools are expected to prepare students for college. 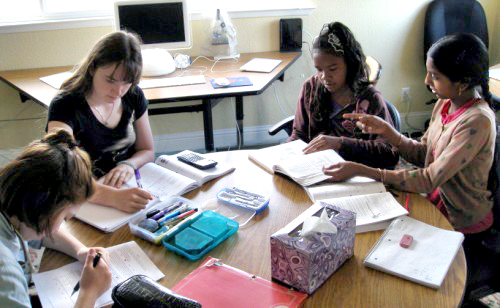 At Living Wisdom School, we look at academic rigor differently. First, we don’t give letter grades – which immediately knocks us out of the discussion of grade point averages. Yet our graduates are accepted by the area’s best high schools, where they tend to do very well. They succeed in college, and they graduate and become successful adults. We resist the traditional notions of academic rigor to which most other schools subscribe. In fact, we consciously don’t want those concepts to enter our thinking, because they’re extrinsic to the learning process, and can actually interfere with learning. For example, let’s imagine that you’re a student in elementary school, and your teacher tells you that you’ll have to take a test. You study for the test, and you focus on second-guessing the teacher so that you will do well on the test. Your teacher has told you the parameters you’ll be tested on, so you focus on those concepts. And that’s where the learning nearly always begins and ends. 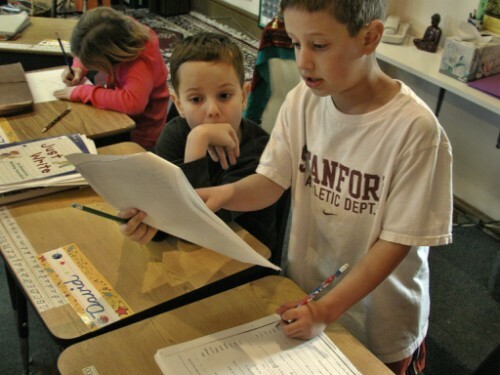 Standard tests or a “learning conversation”: which gets the best results? In the classrooms at LWS, there’s a conversation about learning that is extremely rich – and, I have to say, all too rare in other schools. The “learning conversation” is something the students experience every day of their lives in our school. I’ve taught for over forty years. I’ve taught in public school, and I’ve taught at every level from second grade to graduate school. And, over the years, I’ve been acutely aware of what’s happening in education. I have friends and relatives who teach in public school and share their experiences with me. With the advent of standardized testing, and the idea that “hard numbers” are the best way to measure learning, there came a tightening and rigidity in the curriculum. My teacher-friends tell me, “My principal wants us to be on this page in the history text, on this day of the year.” That’s how stringent the state-mandated public school curriculum has become. And the teachers tell me how hamstrung it makes them feel. Gary, can you say a few words about this? Gary (LWS middle school teacher): A teacher in Palo Alto recently quit after thirty-plus years, because the system would no longer allow her to teach her kindergarten children about butterflies, and she could no longer let them play. 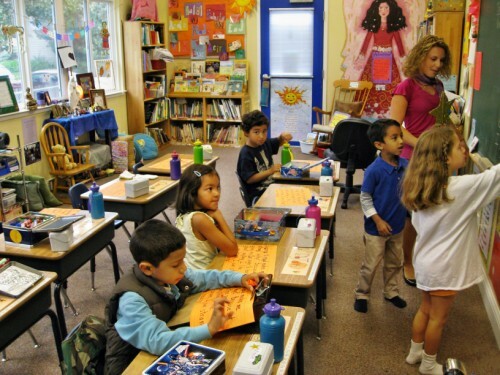 The school authorities were imposing whiteboards and technology on the kindergartners. She tried to work within the system for a while, but eventually she decided she couldn’t in good conscience continue to teach in that system. When she quit, several parents of her students came to us bemoaning the fact that Palo Alto had lost this wonderful, gifted teacher because the system insisted on imposing its will. Here was a fine teacher who quit because she was forced to meet the rigid state testing standards, within a school culture that decided to stop letting the kindergarteners be children. Helen: To compare, our school is infused with a philosophy that not only allows spontaneity, but encourages it as a key part of the learning experience. Classroom teachers have described the California public school curriculum standards as “a mile wide and an inch deep.” And if you look at the curriculum online, I think you’ll agree. At Living Wisdom School, we aren’t interested in forcing the kids to plow through a long textbook, merely to ensure that when they take a test at the end of the semester, they’ll score seventy percent or higher. We want our kids to be involved in the wonder and joy of learning. We want kids who are eager to come to school every day. We want them to go home and be able to have a dialogue where their parents can engage with them about what’s going on at school, and they’ll have something genuine and enthusiastic to say. If a child resists talking about school at the end of the day – and some do – we want the parents to be able to look at a portfolio of the child’s work and realize that they are engaged in something wonderful and valuable, something that will help them at every stage of their academic and personal careers. I’ll talk more about portfolio assessment later, because it’s an important alternative to standardized testing, and it’s so much more thrilling, engaging, and productive of genuine learning than taking a test, getting a grade, and forgetting what you’ve memorized. We’re interested in a curriculum that makes sense to the children. We want a curriculum that is rich and relevant because it addresses what’s happening in the students’ lives. To create such a curriculum, you need to be fresh – you cannot be glued to a lesson plan that you’ve taught for the last five years, and you cannot blindly follow a lesson plan that someone else has mandated. A parent told me about a school where they have a full-time curriculum advisor whose sole purpose is to develop the curriculum. There’s nothing wrong with that, so long as it doesn’t preclude the classroom teacher from manipulating the curriculum to meet the needs of the students sitting in front of her. How can you standardize a group of people and still get the best out of them? As I look at you, I see that you are different, and when I speak to you, I see that you are filtering my thoughts in unique ways. Why is this? Because your circumstances and your concerns are completely and inexorably individual. Now, when I look at a group of children sitting in those same desks, I see the same thing – I see a group of unique individuals with unique needs. In fact, I never come into a class without a lesson plan, but I can never presume that I’ll be able to keep my lesson plan fixed in stone. After forty years of teaching, I never “wing it.” But then, I always wing it. As a teacher, you spend a great deal of time thinking about your lesson plan. You prepare it and get excited about it, but as soon as you come face to face with your students, you say “Aha!” and you start to modify it. 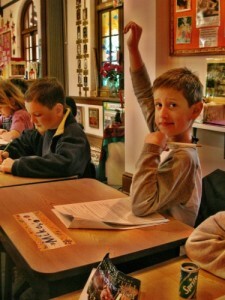 A child asks a thoughtful question, and you deviate from the curriculum to follow the energy. 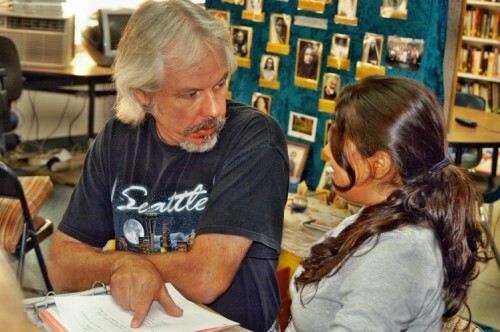 You make a connection, or the student makes a connection, and another student chimes in, and all of a sudden, in a classroom that isn’t hamstrung by a rigid curriculum, you have a vibrant conversation – a dialogue that sparkles with depth and breadth, guided by the teacher, but where the teacher isn’t at the center. With a prescribed curriculum, the teacher is straitjacketed. That approach can never work as well as when the teacher is deeply attuned to the individual student and open to the opportunities of the moment, and ready to mine those moments for all they’re worth. When the curriculum and the conversation around it are deeply engaging and expansive for the students, they learn more, absorb more, and retain more. True learning happens not by memorizing the nuts and bolts of the curriculum. It happens when you ask big, over-arching questions and invite the children to relate to them, each in their own authentic way. People ask me, “Helen, how can you teach a language arts class that includes sixth, seventh, and eighth graders?” They imagine it must be a mind-boggling task. But, in fact, it’s a piece of cake. It doesn’t bother me that the sixth grader doesn’t know what the seventh or eighth grader knows. And it doesn’t bother me when the sixth grader knows something that the eighth grader doesn’t. And the reason is that we don’t look at our classes at Living Wisdom as uniform groups of students sorted according to their ages. We look at them as groups of individuals. 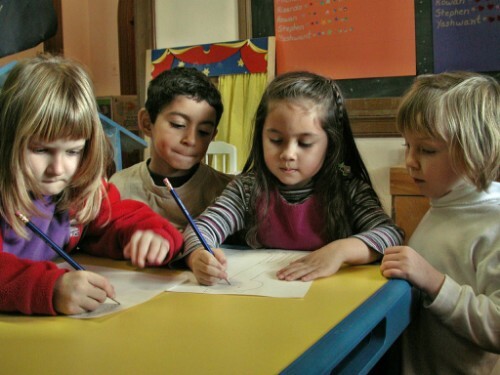 When you standardize the curriculum, you risk losing the children’s individuality. And I think that’s why they respond so joyfully in our school, because they feel seen, heard, cared for, and supported, each in their own way. Each child has unique needs. I have a student who slouches and hides behind the person in front of him. Now, it’s my job to notice that – not to embarrass the student, but to find those moments when I see a flicker cross his face that tells me he has something to say, but he probably won’t say it unless I prompt him and start a conversation. Now, there is no pat formula for this kind of learning conversation. You can’t standardize it. Parent: Can you tell us how you coach other teachers to do the same? Helen: There’s a page on our website that addresses this beautifully. It’s called How Living Wisdom School Trains and Hires Teachers. Our faculty are the heart and soul of our school, and with a school such as ours, which embraces a unique classroom approach and philosophy, it’s important that the teachers be sensitively attuned to what we’re doing. What makes Living Wisdom School unique is the Education for Life philosophy. Education for Life totally informs how we relate to each student and how we manipulate the curriculum to get the best for each child. Briefly, we choose our faculty by evaluating how well the teacher is in tune, or could be in tune, with the EFL philosophy. 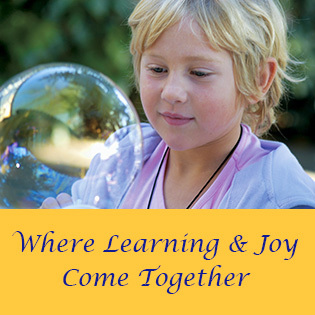 The core of our philosophy is that we help children embrace an expansive approach to life that will bring them continued success and increasing happiness, as opposed to contractive attitudes that invariably result in learning difficulties, conflict with others, and failure. I’ve interviewed teachers who had impressive degrees, who were credentialed by the state and had many years of experience with other systems, but who couldn’t make the leap to what we’re doing. In contrast, some people may not have Ivy League degrees or a ton of experience, yet they instinctively “get” what Education for Life is about. An excellent example is Craig Kellogg, who began teaching fourth grade this year. Craig didn’t have lots of experience as a teacher, but he trained as a full-time intern in an Education for Life classroom for over a year under the guidance of a very experienced mentor teacher. Equally important, all of the teachers quickly realized that Craig has a profound attunement with our philosophy that expresses in how he teaches and how he articulates our ideals with the children. So we’re confident that he will be a phenomenal teacher in our system. But let’s talk about our approach to the curriculum, which is a key cornerstone of our philosophy. Our school is geared to give students faith in life, faith in themselves, and faith in their future. We’re upbeat, optimistic, and affirmative, and we have our feet planted firmly on the ground. We teach what you might think of as “success attitudes.” And we’re acutely aware that the curriculum is crucial for success. We’re upbeat but we’re authentically so. We don’t hearken back to the self-esteem movement, which practiced lots of vague affirmations that usually had often little connection to reality. Proponents of the self-esteem movement believed that if you tell children how good they are, and repeat it often enough, they’ll be good. 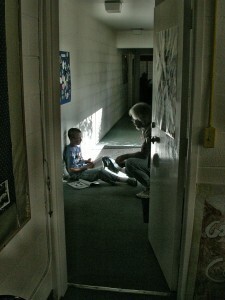 In our school, we wait for the moments when the child experiences a success, whether large or small. We watch when they’re trying, when they’re being mature, and we notice it with enthusiasm and encouragement. They love that honest, genuine, earned attention, because they know it is authentic and real. It isn’t a vapid statement about a goodness that the teacher imagines in them and decides to affirm. We encourage our children to build on their real successes, and they are highly motivated to replicate the behaviors that elicit the praise. It’s extremely liberating for the children to feel that we’re acting for their long-term best interests. And when they feel free, they begin to learn optimally. Instead of being nervous and stressed and forced into a mold, they’re free to apply their full, positive energy without fear of soul-crushing criticism. Education for Life includes the standard curriculum, but it gives the children daily experiences of their own best strengths. The author of Education for Life describes maturity as “the ability to relate to realities other than one’s own.” It’s a simple definition – but think how much it implies. Before we can relate to realities beyond our own limited concerns, we must have a firm sense of who we are. We must be able to stand strongly in our own reality, and expand from there to include others. This is a basic principle of human interaction. When we know how to behave with self-control, we’re able to give others the “space” to be themselves, and we can resist getting lost in our own emotional chatter long enough to understand them. It’s a skill that is all too rare even among adults today, yet it’s a tremendous asset for success in school and life. It’s one more reason why the Education for Life approach devotes a tremendous amount of energy to helping each child achieve a sense of their self-worth. When children have self-worth, they will nearly always surprise the heck out of you by what they’re able to achieve. This is nowhere more apparent than in the speeches that the children give at the end of the school year. 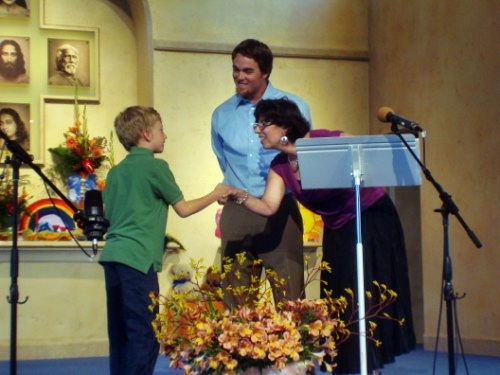 Each child stands up before an audience of two hundred parents, relatives, and students and talks about the qualities that the Living Wisdom School teachers have chosen to celebrate in them. I wonder how many of us adults could imagine walking on stage, commanding a microphone, and speaking to a large audience when we were five years old. Think about that. Because a child’s self-worth is deeply connected to his or her ability to learn. Children who are strong and confident are more interested in learning. You can never divorce a child’s attitudes from the learning you hope to nurture and measure in them. When the children give their year-end speeches, they all, without exception, demonstrate the maturity of an expanded consciousness. It’s evident even in the extremely brief speeches that the kindergarteners give. Here’s an example of how it works. A kindergartener receives the quality of Friendship. She talks with her teacher about what friendship means, and why she received this quality. The teacher may describe it as being able to extend ourselves to others, and graciously receive from them as well. Once they understand their quality and can appreciate it in themselves with the teacher’s help, they’re ready to give their year-end speech with understanding and enthusiasm. And because it’s a deeply personal value that they’ve celebrated in front of two hundred people, they’ll identify with it and remember it for the rest of their life. 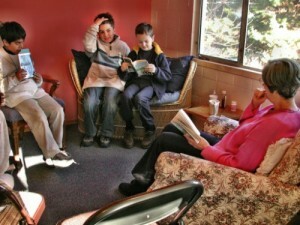 At Living Wisdom School, we help each child become aware of their own unique internal reality. We want them to be sufficiently aware of their strengths, and encouraged in them, that they’re always working enthusiastically on the outer edges of their growth. We don’t ask them to do things for which they aren’t ready, but we celebrate what they can do. The qualities we give them reflect what they’re working on now. For example, a child might spend the school year focusing on developing several important attitudes and skills, and we’ll celebrate their progress by awarding them that quality at the end of the year. We’ve given children the qualities of Courage, Clear Thinking, Artistic Expression, Perseverance, Independent Thinking, Self-Confidence and Poise in Performance, Humor, Sincerity, Vitality, Luminosity, and Artistic Imagination, to name just a few. The quality that the child receives isn’t chosen by a single teacher. The entire faculty chooses the quality, because it’s a special feature of our school that every one of our teachers gets to know each child. The child’s classroom teacher will make a suggestion, and another teacher might say, “Oh, I had this interaction with him, and I wonder if this other quality might be good for him.” It’s one of the best faculty meetings of the year, because we’re thinking of the best in each child and celebrating the progress they’ve made. 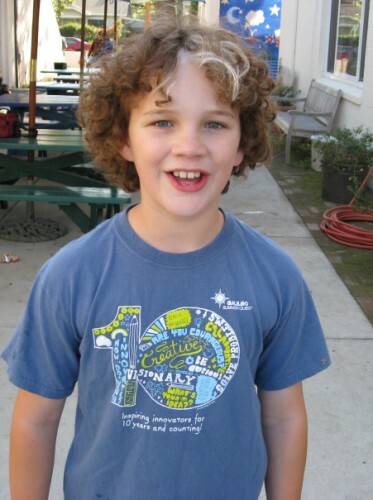 This year, a student entered our school as a fourth grader. Coming into a new environment is always a huge challenge for a young child, but he adapted beautifully, so we honored him with the quality of Courage. Our commitment to noticing, supporting, encouraging, and celebrating children and helping them develop positive personal qualities translates into academic success in powerful ways. As evidence, we suggest you consider watching the videos of the eighth graders’ graduation speeches. When I taught at a large public high school in Oregon, one year I was assigned to teach two senior language arts classes. The first was an advanced placement class, and the second was the lowest English class offered in the school. These kids had come through four years of high school with the constant affirmation that they were stupid, and I decided to challenge their self-image. And we did. We read Sophocles, Shakespeare, and Chaucer. They wrote a modern prologue to the Canterbury Tales – in verse! And they had fun. Instead of framing every assignment as pass/fail or a graded experience, we took it one step at a time, supporting each other all the way. I said, “You can re-write your essays as many times as it takes, until you and I are both happy.” They were amazed. It was a completely novel idea that they could work on something until they liked it and were satisfied and successful. At the end of the semester, I gave them individual qualities that were beautifully inscribed on an elaborate certificate, as we do at Living Wisdom School. Of course, for them it couldn’t be true, because the old paradigm was based on noticing what a person couldn’t do, and measuring how far they were falling short. And just think what that means. If you define a person in terms of what they can’t do, it’s bound to become their self-image, and when you believe you can’t do something, you’ll never try to do it. In middle school math at LWS, we challenge the old paradigm the same way I did with the high schoolers in Oregon. Gary, when they get something wrong on a test, how do you and the other math teachers handle it? Gary: When we grade the test, we give them their scores, then Eric and I sit down with them and go through every problem they got wrong together, so they understand the concepts and how to do the math. We work with them individually on every single concept until they get it right. We set up the tests so that sixty percent of the questions are a review of concepts they’ve been tested on before, so they’re continually reviewing concepts. When they graduate, they’re really solid in math, because they haven’t skipped along the surface, just taking tests for a grade. We see the results when they graduate and enter high school. Mariah Stewart “tested out” in math, for example, and I think Percy will test out, too. Helen: What does that mean, “testing out”? Gary: Because an A in one school isn’t the same as an A at another, the high schools test the entering students to find out what level of math they’ve actually achieved. The schools also ask for recommendations from Eric and me, because we’re part of the math teacher team at LWS. But the students still have to take a placement test. When Mariah took the tests to enter high school, she tested out of Algebra I. She hadn’t finished the geometry book at LWS, but the proctor asked if she’d like to take the geometry test, and she said, “Sure,” and she tested out of geometry. So she was placed in Algebra II and Trig as a freshman. Now, because Mariah and her mom are very conscientious, she’s working on geometry over the summer so she’ll be solid. In public school, there’s a tendency for students to want to “just get through the course.” But our math teachers – Richard, Eric, Leslie, and I – stress content, understanding, and mastery. Percy finished the geometry book here, and he tested out of geometry as a freshman. Kieran had an entrance appointment at Mid-Peninsula High School, a highly regarded private school in Menlo Park. The interviewer spent two-and-a-half hours talking with him one-on-one, and after the interview she told his father, “He’s really solid in math.” The children get a solid education here, and they really know the content. In our middle school, we’re fortunate to interface with the top schools in the area as we help our graduates prepare for the transition to high school. In the fall, I’ll be giving a class for the middle schoolers on the high school entry process, so they’ll be aware of the entrance requirements for each school and how to submit their applications and transcripts. Helen: Tell us about the article you posted on your bulletin board. Gary: This is an article that appeared in the Palo Alto Weekly, by a girl who was student body president at Palo Alto High School. It was actually her graduation speech, where she told how she played four sports, had a 4.0 average, and received early acceptance at Stanford, and how she hit a wall at the end of her senior year. She described how she stayed home for three weeks at the end of the school year because she was crying uncontrollably. She had pushed herself so hard that she broke down. The other kids were teasing her, “You got early acceptance, that’s why you stopped coming to school.” But she explained that it was depression caused by pushing so hard that she collapsed. She advised the other kids to lead a balanced life, and she shared that she would take a year off before she entered Stanford. Balance is crucial in a child’s life, because the stress and pressure that kids feel, whether subtly or openly, is not healthy. This young girl learned a valuable life lesson, but as I read the article I was thinking that at Living Wisdom School no child would ever have to learn about balance in such a brutal way. Helen: Let me talk about several myths about academic rigor that I suspect contributed to that girl’s collapse. 1. 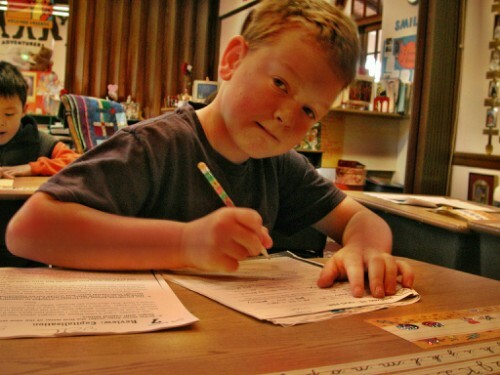 The first myth is that homework is a measure of rigor. In fact, it depends on the homework. If it’s rote memorization, how valuable will that be, in the long term? 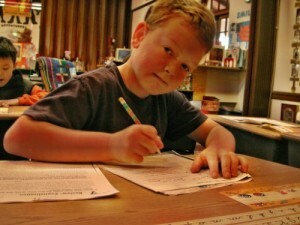 Does it develop the child’s learning skills, or their ability to think clearly and creatively? Homework is a fact of life. Our kids learn to handle it, but the amount that’s given to kindergarteners today in many schools is hard to fathom. We need to ask why, and whether it’s being given under the false assumption that quantity can replace quality. 2. A similar myth is that academic rigor means “doing more” – giving students more subject matter in every lesson, more books to read, more writing assignments. But this is clearly not true, again because quantity has little to do with quality, or with developing the abilities that will enable the child to be successful in high school, college, and life. 3. “Rigor isn’t for everyone.” This is a myth that many people believe. They mistakenly think there are special people who have the ability to do anything that’s rigorous, demanding, challenging, and deep, and that other people can’t do it. But it’s a false assumption. While there are exceptional individuals in any field, at Living Wisdom School we believe, and have routinely been able to show, that every single student is capable of receiving a rigorous education. 4. “Providing support decreases academic rigor.” This is a currently popular myth that forcing children to “tough it out” on their own will develop their ability to “adapt and survive.” But quite the opposite is true. When Gary, Eric, Leslie, and Richard teach math, for example, they offer the students a tremendous amount of support, and when I return the students’ writing assignments in my language arts class, I do the same. Gary, can you tell us about the homework club? Gary: In middle school, we offer study hall for two hours after school, three days a week. The students can roam about and relax, but the agreement is that they’re working on homework. The kids really appreciate it, and the parents do, too, because it means that by 5 o’clock the students have finished their homework, and they can go home and have dinner and spend time with their parents without the stress of homework looming in the background. But it’s fun, and the kids love it. 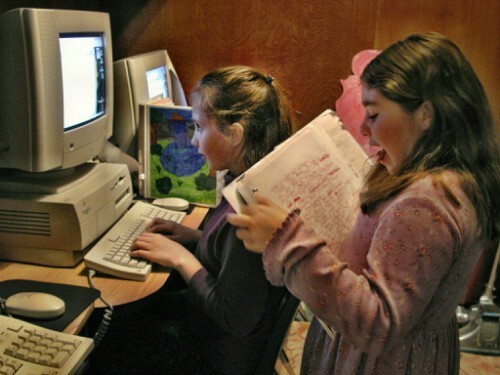 It’s a great thing for them, because it gives them the structure they need, along with all the necessary resources – computers, textbooks, a teacher, and the other students. Plus, they get tons of support and feedback. “What’s that concept, again?” And another student will explain it. “No – Helen said she wanted the first draft tomorrow.” It’s gentle support. They’ll say, “Let’s sit together,” even though they’re not doing the same lesson. They’ll be spelling different words, and they’ll quiz each other. It’s all self-motivated, and I love it. Helen: That idea, “self-motivation,” is key. It’s what we strive for. A fundamental principle of Education for Life is that you can never force a child to learn, but you can make it so enticing, magnetic, and engaging that they eventually do want to learn. Helen: I do believe in bribery at times. But part of the philosophy of the school is that we are “invitational.” Gary doesn’t have to stand over the students with a frown and a ruler in study hall – “You’re going to sit here until you finish your homework!” Instead, you develop a curriculum that gets them excited and engaged. 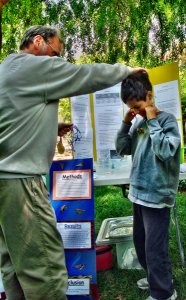 For evidence of this, you can watch the videos of our students presenting their science fair exhibits. 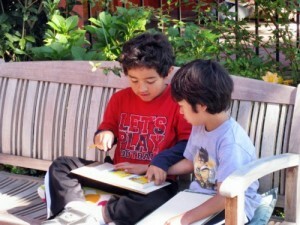 Parent: I discovered that my children have very different styles of learning. My daughter is a “go with the flow” kind of person, and she’s forgetful. She would leave her body if she couldn’t carry it with her all the time. And the way she learned to remember is that she and her teacher got a whiteboard, and my daughter made her own flowery checklist. The biggest change I saw is that she has learned to take possession of her things. She knows what she needs to take home, and if she forgets it and can’t do her homework, she doesn’t get in trouble – she just notices what happened and learns from it, and that was her biggest lesson of the year. I appreciated that Ruth, my daughter’s fourth-grade teacher, gave her students a packet of homework that they needed to finish by Friday. My son was the type of child who would say, “Oh my God, I have to finish this…” And for the first week he stayed up until 10 and woke up at 4. We wondered, “What is he doing?” But we didn’t interfere, and after two or three weeks he figured it out, “I don’t have to compete with the other third graders every day. I can do a little bit at a time.” It took him six months to figure it out, but I think it’s a great skill for a seven-year-old to learn, how to do a project slowly, every day, without my having to watch him. It’s a different style of learning from his sister’s, and it’s a skill that will be useful to him. I use that skill, of time management and making lists, at my job, so I can really appreciate it. But it’s not something that you can quantify with a test. I see how even with his guitar practice now, he does a little bit every day. He doesn’t cram, and I’m grateful. Helen: Part of it is the individualization that happens when the teacher knows how to recognize the uniqueness of each child and adjust the curriculum to meet their needs. On the topic of children as individuals, this is a book that greatly influenced my teaching. It’s called Frames of Mind: The Theory of Multiple Intelligences, by Howard Gardner, a professor of cognition and education at Harvard. I read it for the first time in 1984, when I was giving workshops on Education for Life, and I’ve since taught it to college and high school students, and I’ve introduced it to the students at Living Wisdom School. Gardner says that people have unique and different strengths – it’s something we all recognize, but he gives evidence that our uniqueness is wired into our brains. He isolated seven “intelligences” that are neurologically independent of one another, and he’s since added others. The first intelligences he talks about are linguistic intelligence, and mathematical/logical intelligence. They are the two intelligences that the SATs and STAR testing address. They’re essentially the rational-linguistic intelligences that run our society today. But if you lived in another culture, you might find that linguistic intelligence wouldn’t get you very far. If you lived on an island, you’d probably find that navigation was important, and that spatial intelligence was valued. If you were suddenly plunked down where survival is an urgent priority, you might value body-kinesthetic intelligence. The other intelligences that Gardner talks about include musical intelligence, interpersonal intelligence, and intrapersonal intelligence. When I read the book for the first time, I thought, “I’ll try this in the classroom.” It’s one of the beauties of Living Wisdom School that if something strikes a teacher as valid, and if it expresses our philosophy, we can apply it in the classroom, because our curriculum is flexible. If you know the philosophy and what makes it exciting for the children, you can choose any methods that will help the children you’re teaching. In fact, nobody has all of the intelligences perfectly developed. As Gardner points out, we all have unique strengths that help us interface with the world, and we can piggy-back our less-developed intelligences onto our strengths. It’s a wonderful insight for teachers and parents who want to understand the child’s unique strengths, and how to help them build on them. Gary and Eric do this routinely in math and science. Sometimes, for example, they’ll choose a textbook that’s more linguistically oriented than spatial, if a child’s strengths are in language. Gary: You get to know the children so well that you end up individualizing each child’s curriculum in math, based on the child’s strengths, and then you help them use their strengths to start developing any weaker areas. For example, you might change the problems for a time, so that they can exercise their strengths and build confidence, and once they’re comfortable with their individual approach, you can go back and challenge them with the problems that formerly stumped them. Building a relationship with the student can’t be overemphasized, because when they’re open to what you’re saying, you can be much more effective at helping them learn. We’ve had kids who entered the school, and I noticed they were holding their shoulders high and tight in math class. Within a few months you see their shoulders relax, because the teachers are always coming over and saying, “Can I help you? Helen: Some of our kindergarteners already know how to read when they enter our school, but others can’t. Now, do you force them all into the same curriculum? No, you give them what they need, and by the time they hit third grade, except in rare cases, they’re all reading beautifully. As a teacher, you continually calibrate the lessons, and you’re making time for every student, and arranging the curriculum so that they feel good about what they’re doing, because that’s when they become happily engaged and start doing well academically. Another book that’s central to our approach to curriculum is Authentic Assessment. The process of Authentic Assessment gives students, parents, and teachers a far more accurate gauge of each student’s academic progress than testing does. So, yes, certainly we give tests, and we give them often, because we need to know that when a student leaves eighth grade, they’ll know how to take multiple-choice tests, matching tests, short ID tests, and long in-class essay tests. So we give them those experiences to ensure that when they enter high school they won’t be at a loss when they’re confronted with midterms and finals. In fact, the students take tests all the way through Living Wisdom School – spelling tests, history tests, math tests, science tests, and so on. Testing is a way to measure learning. But it’s the way we test that makes all the difference. I remember tests in high school where we were asked to spit out information that we were expected to memorize verbatim. They were so rote that when I was done I quickly forgot everything I had memorized. There was nothing I could take from the test that would make me a better student, a better person, a better learner. So when we create an objective test at Living Wisdom School, we are very careful to construct questions that are meaningful, relevant, and fun. (Humor is an amazing tool in the learning process.) Then we assess the results in terms of helping the students achieve their personal best. Testing or assessment — which produces the best long-term gains? If you want to assess a student’s true progress, you need to observe the student as a person, and not just as a mathematician, writer, scientist, or artist. During the school year we have three conferences with the parents of each child. The conferences are a wonderful tool for creating an important partnership in the child’s life, between the parents and teachers. There’s a rich dialogue during the conferences. The teacher might ask, “What are you saying to the child at home?” Or a parent will tell us something about the child that we couldn’t see at school. “He was really upset about this.” “He was so stressed-out about that.” As soon as we know it, we move to address what’s happening with the child. At the center of the parent-teacher conference is the child’s portfolio. During the school year, we collect samples of the children’s work in an accordion folder. For example, in language arts I ask the students to keep every draft of everything they write, because I want them to see the stages of their writing, and I want to be able to sit down with the parents and show them the trajectory of improvement. The benefit of portfolio assessment is that it avoids the fuzziness of letter grades. What does it really mean to get an A, B, or C? Did the child actually learn something? Did they improve their ability to learn? Did they become enthusiastic and self-motivated to continue to learn in a field of study? Or did they simply “study to the test” and quickly forget most of the facts they crammed? Years ago, some researchers asked a group of teachers to grade the same packet of essays. The grades they gave ranged from 99% to 2%. Several months later, they asked the same teachers to grade the same essays again, and some of the teachers who had given A’s now gave F’s, completely reversing their grades. The study verified the invalidity of the traditional grading process, where grades are assigned subjectively. At Living Wisdom School, we want the students to develop abilities that go far beyond anything that’s measurable by a letter grade. We want our students to be able to look at their own work and see where they were, and how far they’ve come. When they leave eighth grade, they’ll have two or three portfolios of their work. At the end of the year, I’ll insist that they put several pieces in their portfolio that I’ve judged to be their defining work – the writing that shows they can write an essay, engage in higher-level thinking, be creative, and engage the reader. You can review many of the students’ language arts portfolio selections in our LWS literary magazine. If you read it from start to finish, I think you’ll see that the arc of development through the grades is mind-boggling. If you give children the kind of curriculum opportunities we offer at LWS, and if you train teachers as we do, where every day we’re in continual communication, developing and sharing curriculum ideas – you get a level of learning that is amazingly deep and engaging, and therefore surprisingly creative and enduring, because it gives the students experiences that they never forget. It’s a far cry from the shallow results of “studying to the test.” It prepares them for the challenges of high school, and more important, for the greater challenges of a university education. Some of the curriculum ideas that emerged this year were stellar. Our kindergarten teacher gave her students a simple learning experience with rain puddles. On a day when it rained, she took the children outdoors, where they measured a puddle. When the sun came out, the class went out again and measured the puddle, which had shrunk from evaporation. Now, that is learning. What are they learning? They’re learning the scientific method, which is about direct observation and experience. They’re understanding the natural beauty and wonder of the world, and they’re asking meaningful questions. It’s a far more “sticky” approach to learning than reading about evaporation in a book. I’m hoping that the beautiful rainbows they drew during an art project that followed the puddle experience will make it into their portfolios. Our third-grade teacher, Ruth Rabin, led her students in an exercise that she borrowed from Erica’s Pre-K class. Erica’s class wanted to build a loft in the classroom, and there was a big discussion about how much it would cost and how to raise the money. The students and parents held a pizza night to raise the money, and then Erica led the students in learning about money. From the excitement of the loft project, they got the idea to create a store. So they created a store, and they would save their money, and every Friday they would go to the store and buy things. Then the students talked about adding taxes, which led to a deeper question – if you add tax, what do you do with the tax money? It has to be used for the common good. It has to offer services. And so you have a class on citizenship. Another class heard about the store, and some of the boys were inspired to create a cardboard iPad and sell it for play money. They got such a big response that they couldn’t keep up with business. Then two kids who weren’t part of the original iPad group said, “Let’s make cardboard iPods and iPhones.” It was a little bit like a hostile takeover. Then the boy who initiated the project got overwhelmed and unhappy and said, “I’m going back to the first model, which was smaller and simpler.” He said, “We’re going to have lay-offs,” and he announced that the children could expect pink slips on their desks on Friday. 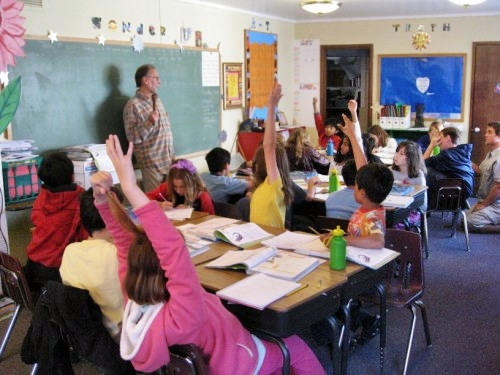 The teacher wondered if it was all a bit too harsh, and she suggested they talk about alternatives, so they had a classroom discussion about how they could manage the business without excluding people. Now, this is a beautiful example of a curriculum that is alive, vital, and meaningful to the children, where they can reflect on what they’re learning, and they’ll never forget it. I guarantee that when they’re our age, they’ll remember it, because it’s real. The same kind of learning experiences happen routinely during the field trips we take with the middle school. On our last trip, we stayed at the meditation retreat at Ananda Village, where we learned about organic gardening, not from a textbook but by working on an organic farm. Gary, what did they do? Gary: They harvested comfrey and laid it on a new bed where it could be worked into the new soil as nutrients. Helen: They learned about the very interesting economics of organic farming, and then, because the literary magazine was coming out, and we were in nature, they wrote beautiful poems. We did history and math as well. Research shows that this kind of integrated curriculum actually develops new brain circuitry. Do any of you have comments or questions? Parent: When my child was a baby, I had a friend at work with two children born ten months apart. I’m a little saddened when I spend time with her now. Her children are in a good school – it’s a dual-immersion school and one of the best in the San Jose Unified School District. But the way they approach life is very different than Living Wisdom School. Her daughter and mine are developing very differently. They’re a wonderful family, but I can very clearly see the influence of the very competitive school environment on this child, which translates as personal attitudes of competitiveness, to the point of putting others down. And it strikes me how lucky we are. Parent: I’m convinced that you and Gary are trying your best to perfect an approach to education. Your desire and your experience and skills are something I haven’t seen anywhere else. And I want to understand how you are helping the younger teachers be like you. Can you share some examples of how you help them develop their curriculum and lesson plans, and how they learn to observe and interact with the kids? Helen: A lot of it is explained in the web page I mentioned earlier, How Living Wisdom School Trains and Hires Teachers. But briefly, the teachers meet once a week with me to explore how we can bring the Education for Life philosophy into our classroom teaching practices. At the meeting, we might talk about an aspect of Education for Life, and we’ll share or develop some curriculum ideas. We also read and discuss inspiring graduate-level books on education that are compatible with the Education for Life philosophy. We choose books we feel will help us improve our classroom practice. We have a second weekly meeting for the primary teachers that’s led by our first-grade teacher, who has a great deal of experience teaching in the primary grades. We call the Friday meeting a practicum, because it addresses specific issues in our daily classroom practice. We’ll talk about curriculum ideas, classroom management practices, and even issues with specific students. It’s a wonderful think tank for the teachers, and an incredible opportunity for the interns and new teachers to learn from the teachers with greater knowledge and experience. The training and continuing education that our teachers receive is exceptional in its content and frequency. It demands a very high level of dedication and energy from all the teachers, because we believe that teaching is much more than a “job.” It’s a calling and a mission. 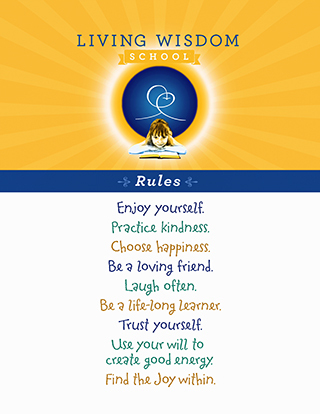 We are creating a new template for education, which we hope will spread beyond Living Wisdom School to schools everywhere.